An impasse between Lovedale College management, staff and students is bringing the Eastern Cape institution to its knees. Violent protests have broken out on campus and buildings at the three campuses are being vandalised. 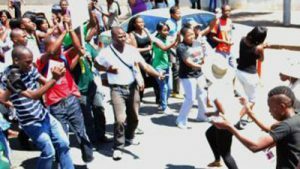 Workers affiliated to National Education Health and Allied Workers’ Union (Nehawu) are in their second week of a national strike. Their demands include full time employment for contract workers and the re-aligning of the TVET sector organogram. The students say they are the worst affected and demand their right to learn and they fear for their safety. However, the management of Lovedale says the situation is receiving attention. Lovedale Principal, Juanita Verster says management is dealing with the issues. Students have been asked to vacate the residences until further notice. The college’s management says it will continue engaging the workers to find a solution. The post No end in sight for Lovedale College strike appeared first on SABC News – Breaking news, special reports, world, business, sport coverage of all South African current events. Africa's news leader..